"Wow, you look really tired and hairy Pat!" Well, it was a very busy time and there was no time to shave on the trip! "You look so happy but why are you covered in scabs?" The Tasmanian bush is really scratchy and I spent a large part of the week burrowing under spiky bushes to retrieve rubbish! "Did you really pick up that many little bits or rope and plastic in those wild places? But I thought they would be pristine and untouched!?" Well, yes, we DID pick up all that rubbish thank you very much!.. - The remaining rubbish that had no future went into landfill at the tip. Over the years we have seen changes, for example recent clean-ups have been picking up many, many more pieces of small plastic. Question for students: What are some things that we can all do to limit the amount of plastic debris breaking down into small pieces on our beaches? Another strong memory that remains stuck in my mind is THE ROPE. There was so much of it and it was obvious most of the bits and pieces or rope had been worked on by someone, eg they had been knotted or spliced and then cut and THROWN OVERBOARD. But by who? 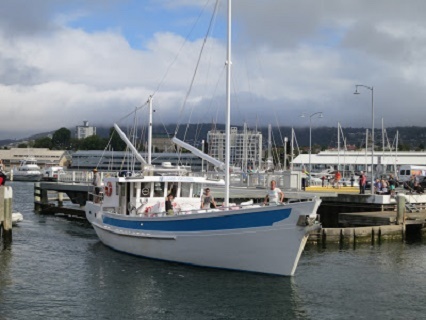 I know all local Tassie fishermen are pretty good with obeying the "Stow it - don't throw it" rule, so that means the culprits could be the crews on the big industrial sized boats that fish in deeper international waters, often with trawl nets and long lines. (Do you remember I talked about this in my post on Day 4 -Tuesday 8 March)? 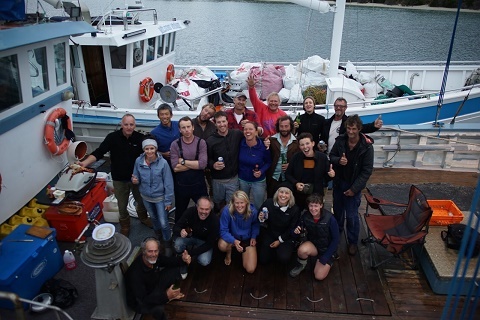 Now, some of this gear may have been lost in storms or washed overboard accidently, but I think we definitely picked up a lot of cut-off gear that could have been lazily tossed into the water by these guys. Another question for students: How do you think we can get the larger fishing boats to stop throwing away their bits of broken nets? 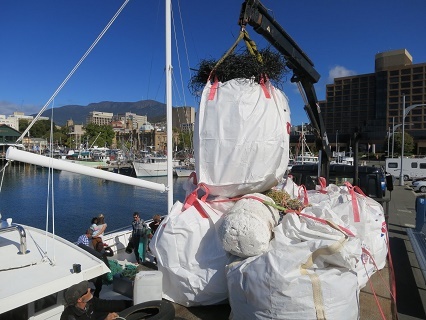 Thanks to the Bookend Trust, Alcorso Foundation and the Australian Science Teachers Association for choosing me to be the embedded teacher on the 2016 Southwest Marine Debris Cleanup expedition. This is Pat Spiers SIGNING OUT! You look happy but why are you covered in scabs?